We are just back from a week of soaking up the magic of the London Olympics. We hadn’t planned to be in London for the Olympics until the eleventh hour so we didn’t have any tickets. Fortunately some of the events we were most interested in – the men and women’s marathons and the triathlon – just required turning up early enough to get roadside seats. Plus we knew we’d be able to watch other events live on the BBC with friends and family gathered around. It was wet and cold but we still enjoyed watching the women’s marathon. At the start of these Olympics there were the usual naysayers (including ‘Mitt the Twit‘, as The Sun nicknamed him) and negative media articles: not enough security personnel, an overloaded public transport system, strikes threatening to disrupt travel to the venues, an unreliable online ticketing system, and unfilled seats. Instead from the whimsical opening ceremony to the grand finale of a closing ceremony the games delivered. Here’s our assessment with scores out of 5 for each criteria. 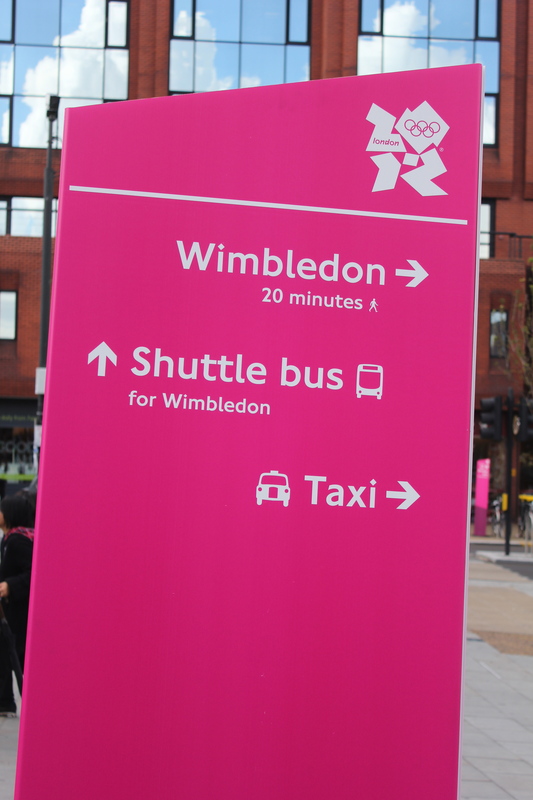 Bright pink signs directing people to the Olympic venues were all over London. The UK spent the last seven years preparing for the last two weeks. Yet heading into Heathrow we were expecting the worst: it typically runs at close to capacity without the Olympics. And what did we find? We sped through immigration and were out of the airport in record time. Sure there were crowds on the London Underground but trains kept running, with minor isolated delays. Bright pink signs pointed spectators in the right direction to event venues. Hundreds of volunteers provided information with big smiles. The only real beef was the luck, time and determination you needed to get a ticket via the online ticketing system. Lord Coe put this down to 2 million people trying to access it at the same time causing it to crash. 66 Olympic records and 30 world records were broken. It’s hard to choose among the amazing performances. Given our interest in running, not surprisingly many of our favorite moments come from track and field. Usain Bolt proved once again that he is the fastest man in the world. Meanwhile Mo Farah’s incredible double on home turf will long be etched in our memories: we sped through JFK airport to catch the first and were brought us to our feet in a friend’s lounge watching the second. The record breaking women’s 4 x 100 metres and David Rudisha’s 800 metres were also breathtaking. We were in a great spot to watch the cycling leg of the triathlon. 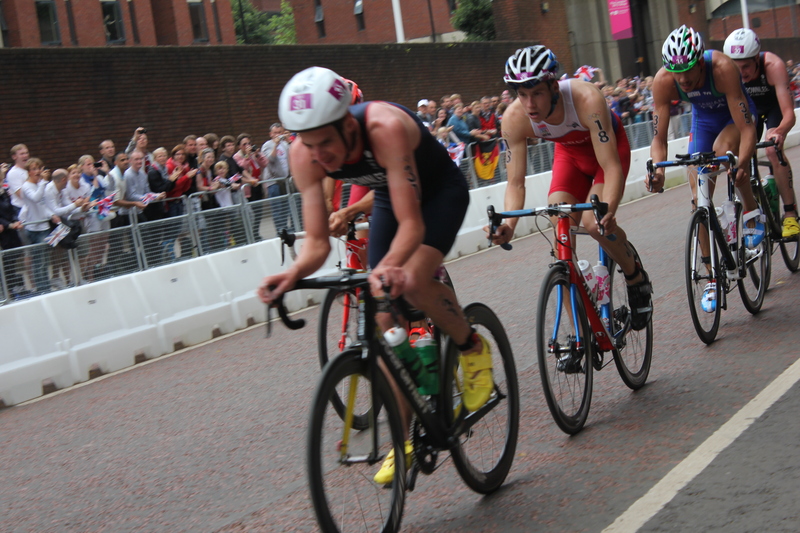 But the highlight for us was watching the Brownlee brothers, Alistair (24) and Jonathan (22), getting gold and bronze medals in the triathlon. 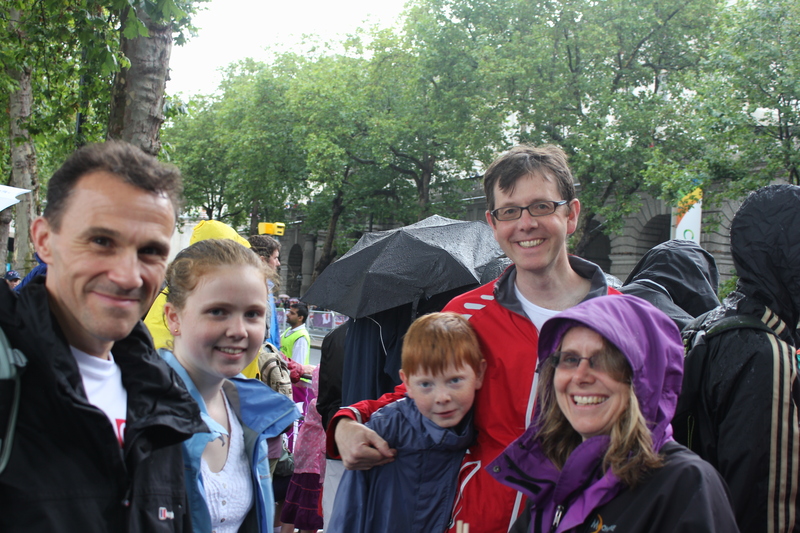 We joined 100s of thousands in Hyde Park for an electrifying experience. Standing by the side of the road, close enough to touch the cyclists as they went by, we witnessed history in the making. Seeing the finish on a big screen with thousands of others made us feel an integral part of the action. 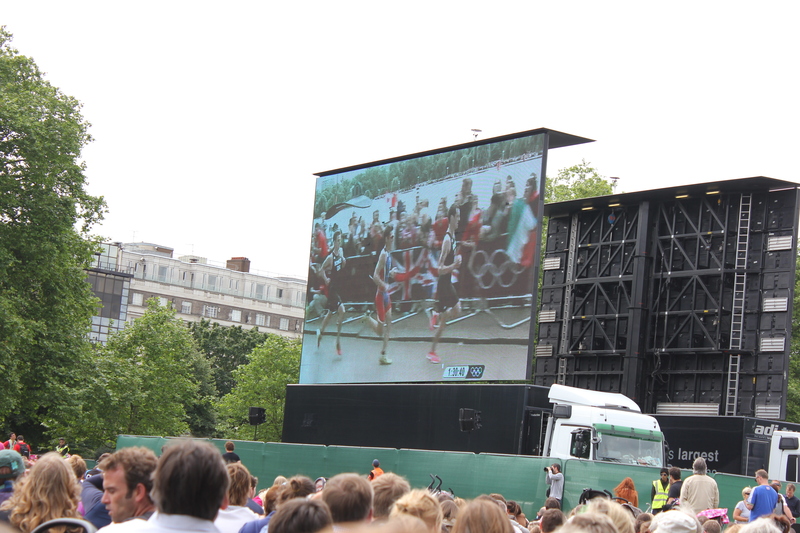 Big screens like this one in Hyde Park came in very useful when the crowds made it difficult to get a good view of the athletes. 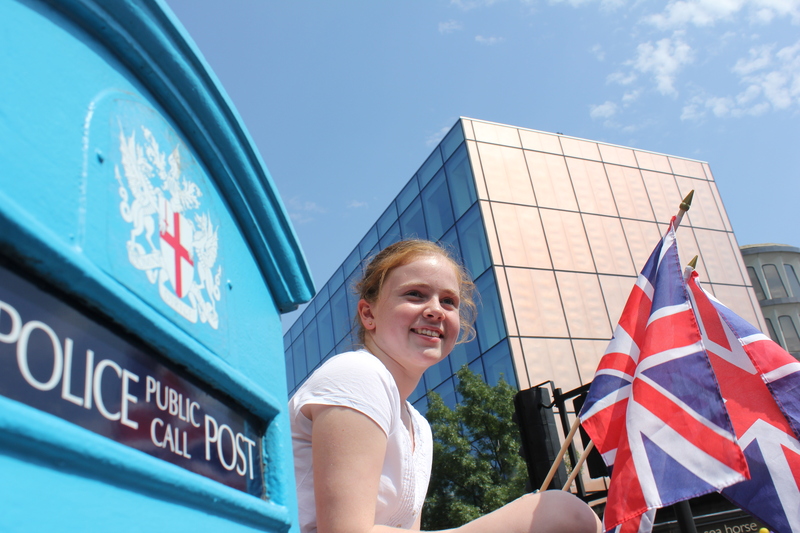 Plenty of smiles and Union flags were seen during the Olympics. An extraordinary sense of happiness and pride filled Britain during the Olympics. Pessimism had been blown away by the success of its athletes in cycling, track, boxing, rowing, sailing and equestrian events. A country that had gotten used to failing to live up to sporting expectations was suddenly basking in the glow of 29 gold medals . Team GB’s overall medal count was the highest since 1908 – then one third of the participants were from the UK. 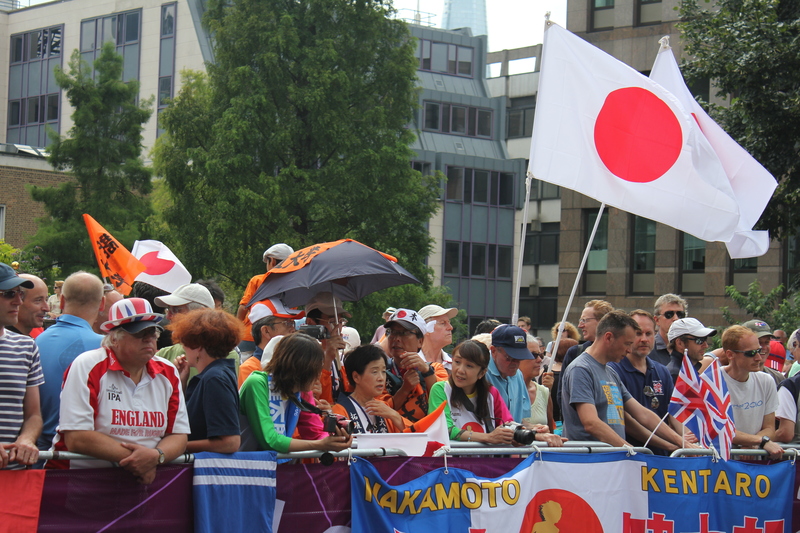 The Union flag proudly adorned clothing, faces and buildings in a show of support to the athletes. But thousands of foreign supporters, many with signs and banners, were conspicuous too – in stadiums, on the tube, on pavements, and by roadside. Flags of many nations were seen along the marathon route. An exhausting amount of cheering was apparent at every event. Sometimes the slowest got the loudest cheers from crowds that valued participation as much as winning. And, as the men’s marathon testified, for many spectators what mattered most was just being there and being part of the atmosphere – often times one could barely see anything! The Olympic Stadium has changed the skyline in the East End. The Olympic events were held in some of Britain’s most iconic settings. Greenwich Park, London’s oldest Royal Park hosted the equestrian events and the pentathlon. A beach volleyball arena was constructed in the middle of the Horse Guards Parade which dates from 1475. 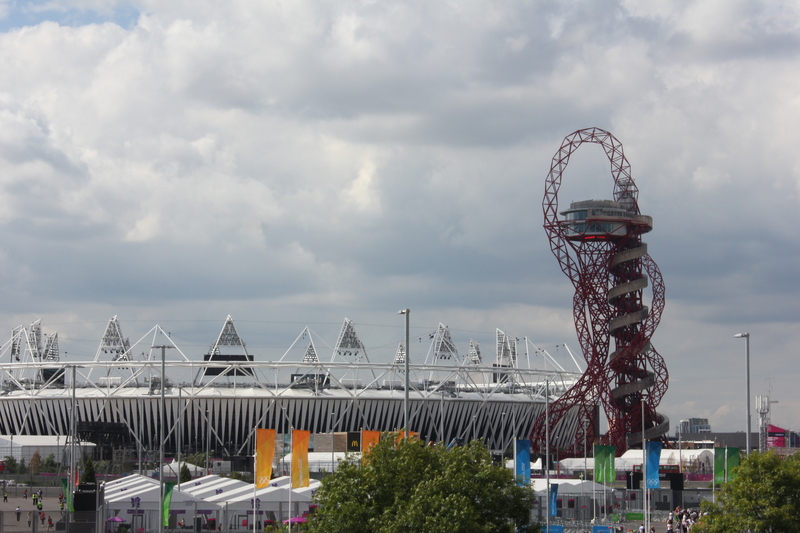 Equally impressive were the new structures built at Olympic Park such as the Olympic Stadium and the Aquatics Centre. These has given a new lease of life to the East End, one of its poorest and most dilapidated areas of London. Like Sydney and Beijing before it, London got to show off its famous landmarks during the road races. In London the marathon course took runners through central London with views of Tower Bridge, St Paul’s Cathedral and the London Eye before finishing in front of Buckingham Palace. 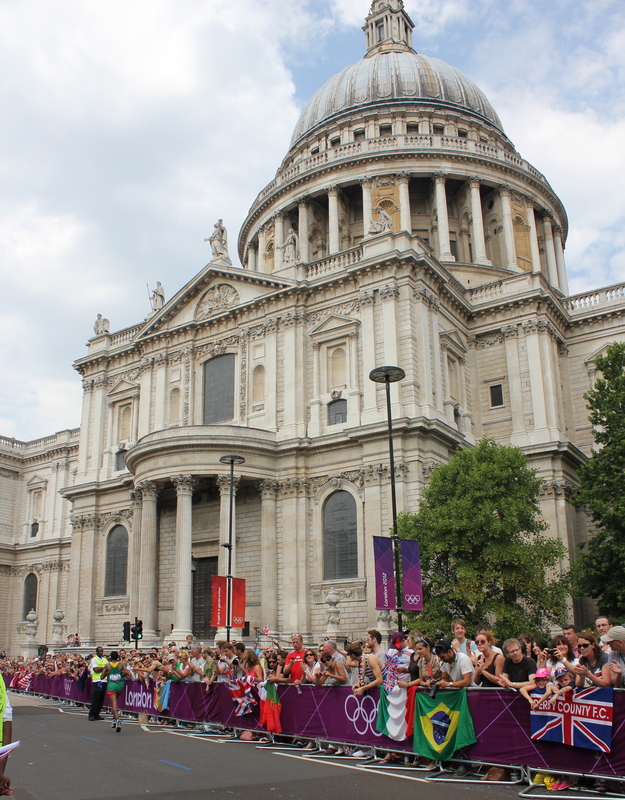 A runner going by St Paul’s in the men’s marathon. Heading back to New York still on an Olympic high we were quickly brought down to earth by a delayed fight and slow baggage arrivals. British Airways and JFK could learn a thing or two from the Olympic organizing committee!